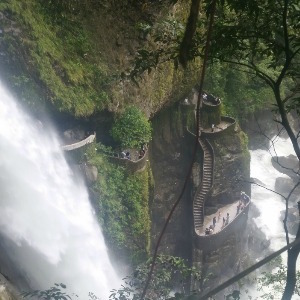 Known as “The Adventure Capital of Ecuador,” Baños has plenty to keep you busy for several days. However, if you have just one day to spend, here’s how to make the most of it. For a taste of local food, eat at one of the many restaurants offering “almuerzos”– lunches from a fixed menu, including a drink, for usually about $2.50. After lunch, catch the bus to Casa de Árbol, the famous “Swing at the End of the World,” for that once-in-a-lifetime photo of yourself swinging off a cliff. 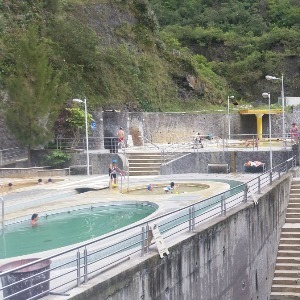 Baños is located at the base of the active volcano Tunguruahua, which means for about $3 you can spend the rest of your afternoon soaking away your stress at one of several volcanic hot springs nearby. The hot springs at El Salado are nestled in a lush valley on the edge of town, and you can breathe in the tranquil mountain air as you rotate between pools of water ranging from piping hot to icy cold. When it’s time for dinner, you won’t find yourself lacking options in this tourist-centric town. However, the locals swear by Leoni’s Pizza, and you won’t be disappointed by their friendly staff and crispy brick-oven pizzas. Baños is home to a lively nightlife, particularly on weekends when Quiteños will come down from the capital city of Quito to party. Wander through the bar district along Eloy Alfero street to enjoy a few reasonably-priced cocktails before heading back to your hotel. You’ll be thoroughly tired from a day of adventures, but it’s likely you’ll be figuring out how to spend longer in this misty mountain town before your head even hits the pillow.